Sugar, Saffron, Cardamom, Rose Petal, Fennel, Khus-Khus, Watermelon Seed, Nutmeg, Black Pepper, Added synthetic colour & Flavour. Take 1 glass (125ml) cold milk. 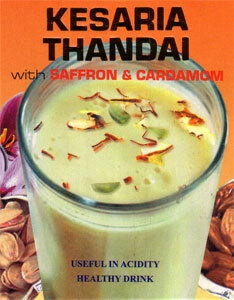 Add 1tbsp KAPOL KESARI THANDAI or 50g to half ltr. of cold milk. Add ice to it. Mix well & serve. Sugar not to be added.